The book “Practice of Dramaturgy” is the culmination of a research project carried out by Konstantina Georgelou, Efrosini Protopapa and Danae Theodoridou from 2013 to 2015, entitled “Dramaturgy at Work”. It included a series of workshops with art practitioners from different backgrounds and roundtable talks with international guests sharing their take on dramaturgy. 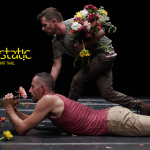 In doing so, they explored and unfolded the distinct and diverse dramaturgical tendencies, concepts and practices within contemporary performance in Europe today. Following the growing interest in the notion and practice of dramaturgy, which is often discussed either as the work of the dramaturg, or as the compositional, cohesive or sense-making aspects of a performance, The Practice of Dramaturgy addresses dramaturgy as a shared, politicized and catalytic practice that sets actions into motion in a more speculative rather than an instructive way. 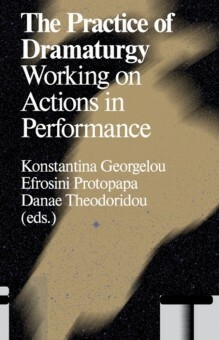 In the first part, ‘Dramaturgy as Working on Actions’, the editors and main authors of the book discuss three working principles that lie at the heart of their proposition, and return to the etymology of the term ‘dramaturgy’ (‘drama’=action and ‘ergon’=work) in order to scrutinize this further by relating it to debates on action, work and post-Fordist labour. The second part, ‘Working on Actions and Beyond’, opens up to different artistic, social and political perspectives that such understanding of dramaturgy may give rise to, through contributions by guest authors: Una Bauer, Simon Bayly, Andrea Božić, Nicola Conibere, Guy Cools, Augusto Corrieri, Ivana Müller, Betina Panagiotara, Joachim Robbrecht, Jonas Rutgeerts, Nienke Scholts, Arabella Stanger, Julia Willms, Jasna Jasna Žmak. Konstantina Georgelou works as a performing arts theorist, dramaturge and researcher. She is currently a lecturer at the Theatre Studies Department of Utrecht University and at the ArtEZ Master of Theatre Practices. Her research interests concern modes of working together, dramaturgy, choreography and ethics a.o. Konstantina has published writings internationally, such as in Performance Research, Performance Paradigm, ArtEZ Press, Maska, On Air etc. 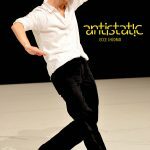 She has worked together with various international artists and collaborates with SNDO, ICKamsterdam, Dansateliers, HetVeem theatre, DasArts and the Amsterdam Master of Choreography. Danae Theodoridou is a performance maker and researcher who lives and works between Brussels and Athens. Her artist and research work explores dramaturgical structures of experimental theatre and dance, fragmented poetics, subjectivity, representation, the performative use of oral and written language, and the notion of social imaginaries. As a performance maker and researcher she has created and/or participated in solo and collaborative live works and research projects in the UK, Greece, Belgium and elsewhere. Her work has been awarded and supported by important cultural institutions. This event is kindly hosted by Goethe-Institut Bulgaria, 1 Budapest Str.